So this is my birthday month. We develop programs to drive customer engagement. While most vendors tell you that engagement is driven by good personalisation and channel strategy; at Digital Alchemy, we believe the relationship between a brand’s interaction with a customer and the resulting impact on engagement is more complex. One of the factors that we believe drives engagement is RECIPROCITY. That is, the relationship between a brand and a customer must recognise that there is a value exchange. Customers will give value to a brand if they feel that their relationship with the brand has an element of value being returned. Did I already mention that it’s my birthday this month? To celebrate my birthday two brands that I have a relationship with made a decision to recognise my birthday and give me something. How nice! Citibank, sent me an SMS with two voucher codes for a free movie, completely free and valid for the next six months. I thought WOW that’s nice. I really felt valued and it was completely unexpected. Good brand experience and I felt was a nice gesture in recognition of the small fortune that I spend on my credit cards with them each month. Qantas also recognised my birthday. They offered me a $25 voucher to buy wine, but with the Qantas voucher the offer came with a condition. To get the $25 voucher, I had to spend $100 from the Qantas wine club. That’s a bit like giving a child a lolly bag for their birthday and saying if you clean your room for a week I will give you the lollies that go in the bag. 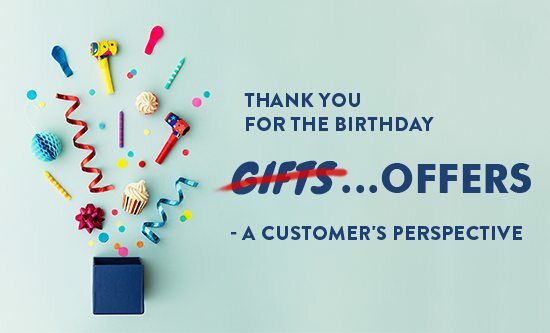 It wasn’t a gift that recognised my relationship with them it was a marketing offer to get me to start buying wine from them. If it’s conditional, it’s not a gift…it’s an offer. So I feel great about my relationship with Citibank…Qantas…not so much.